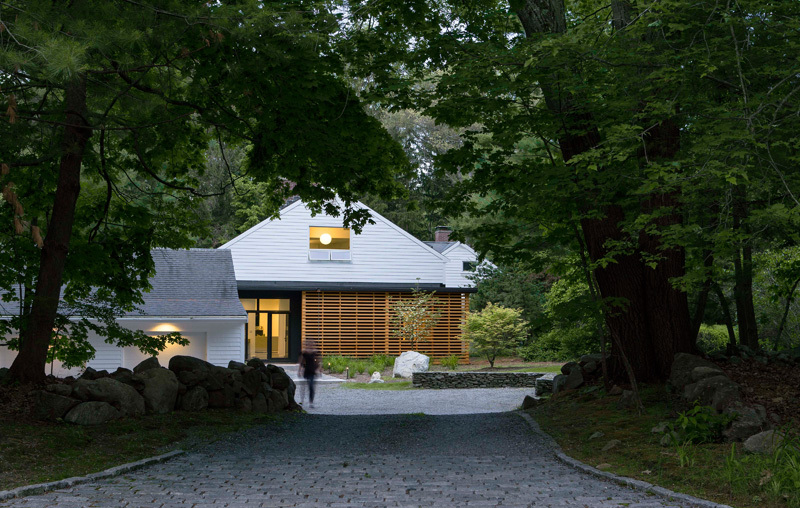 Aamodt / Plumb Architects have completed the renovation of a mid-century home in Lincoln, Massachusetts. 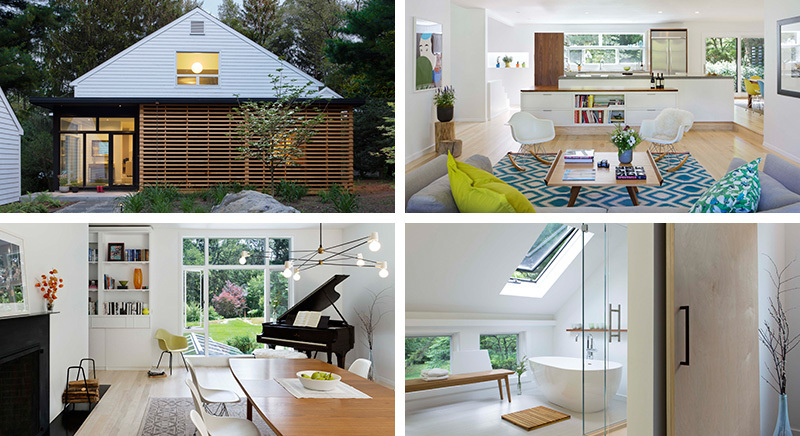 Three old barns were converted to a mid-century modern home in the 1950’s by Henry Hoover, a prolific architect that built many Mid-Century modern homes in Lincoln MA. In 1985 parts of the house were renovated to create an eclectic facade and gallery with a sculptural kitchen and entry. Thirty years later the house has undergone another transformation that clarifies the architectural lineage of the original structures and the Hoover design. 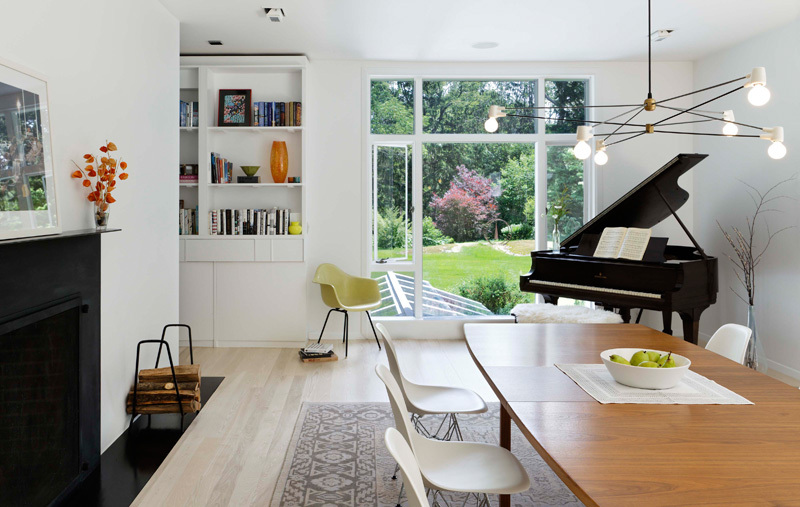 The young family that bought the house loved the large windows, generous proportions and connection to the landscape but found it difficult to use the kitchen and gallery space. 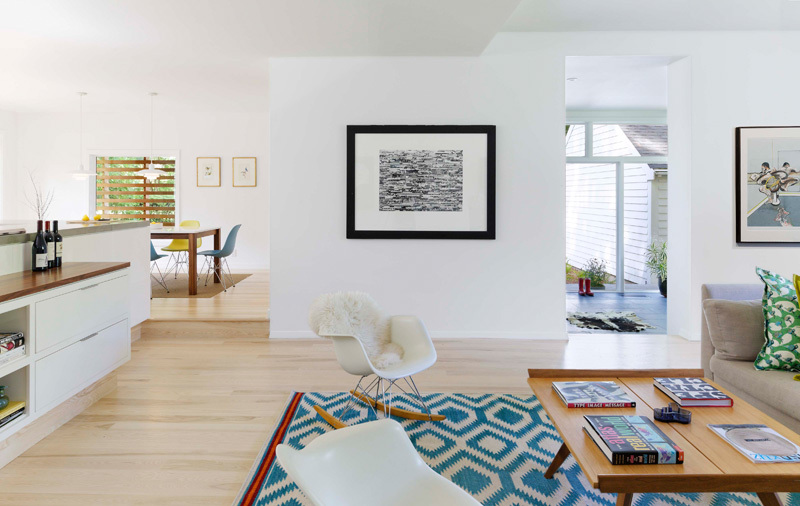 Mette Aamodt and Andrew Plumb of Aamodt Plumb Architects were enlisted to clarify and reorganize these problematic areas as well as update the interior. 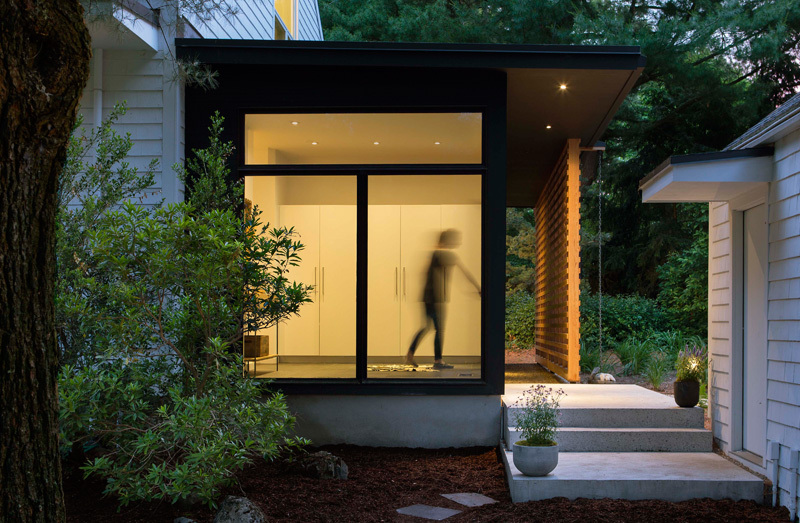 The architects combined their pragmatism with a minimalist approach to renewing the home. After much deliberation, it was decided to remove most of the 1980s addition and restore the original massing. 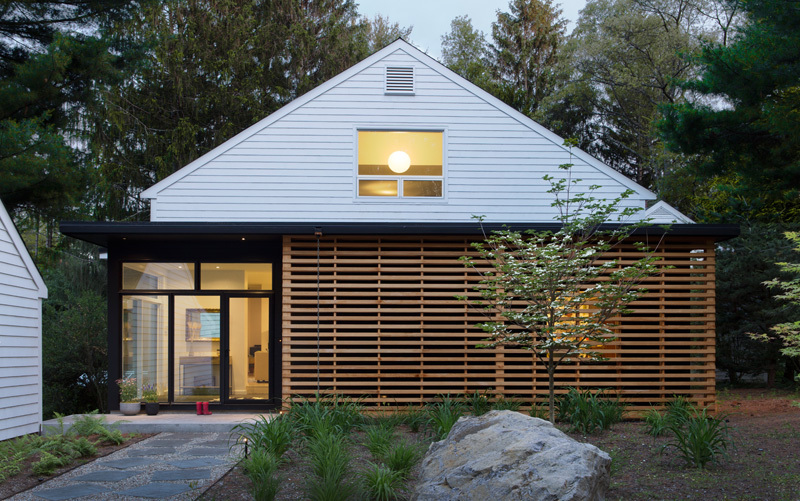 This move allowed the architects to reveal the simple forms of the three original barns and incorporate a new entry into the home. The new open kitchen, a step up from the living room, lends what the clients call a “captain of the ship feeling” to the space. It has concrete countertops juxtaposed against glossy white cabinetry and large windows that frame the landscape. Upstairs, a semitransparent gray stain gave the 60-year-old cork flooring a fresh look. 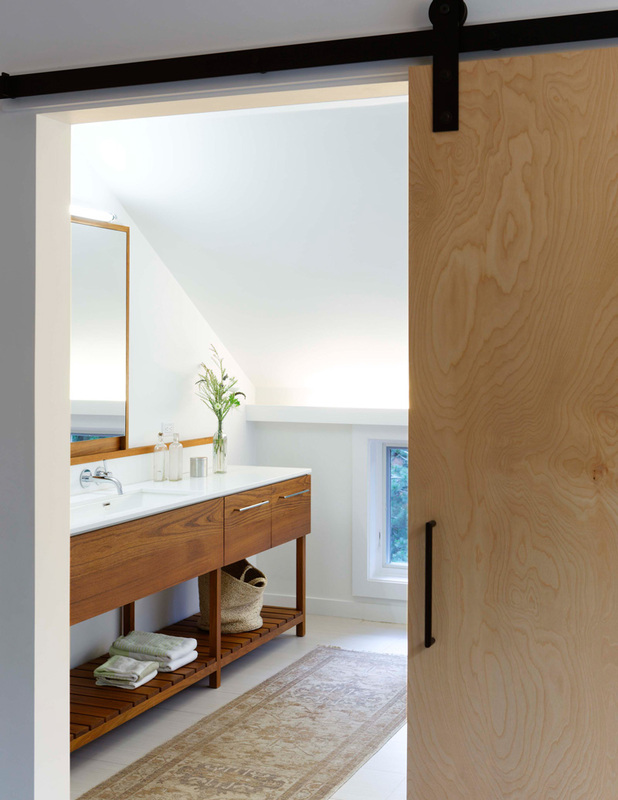 Aamodt / Plumb created a master bedroom suite with two walk-in closets under the eaves, adding sliding barn doors made of birch plywood. 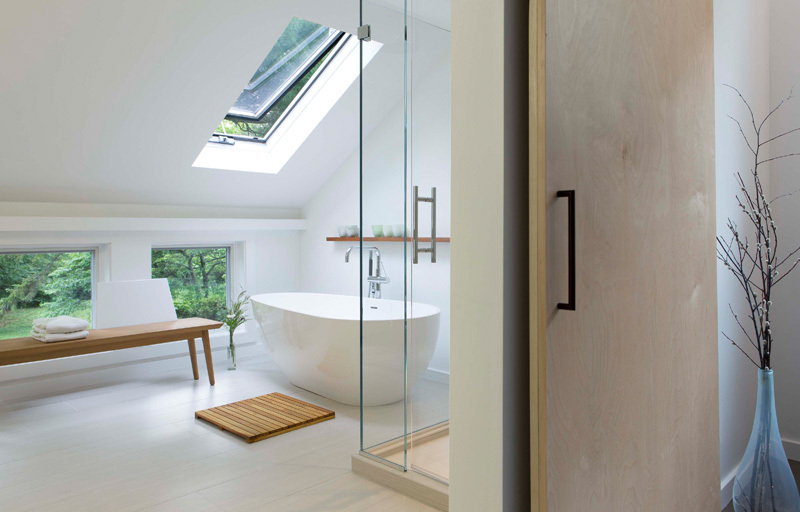 Also built under the sloping roof, the zen-like master bath has a soaking tub beneath the skylight . 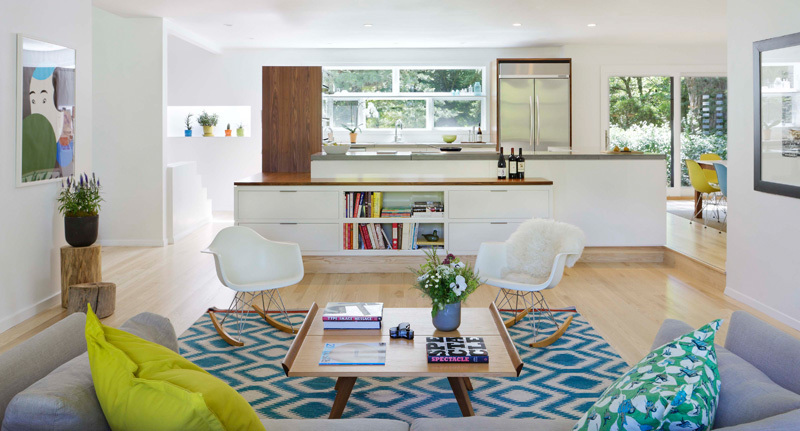 “For renovations, there is a complicated balance between maintaining the original intent of the home, meeting the needs of the home’s new owners, and the desire to do something new and interesting” says Andrew Plumb. In Lincoln, the way that the house is sited, and the way that the architects have simplified and opened up the house to nature and to the young family is truly a success. The renovated home is refreshingly minimal, retains its historic feel and perfectly accommodates the new owners’ modern lifestyle.